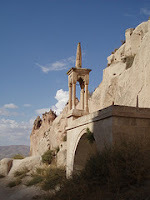 The Region of Cappadocia was very peaceful also during the Ottoman Period. Nevsehir was a small village in the province of Nigde until the time of Damat Ibrahim Pasha. At the beginning of the 18th century, especially during the time of Damat Ibrahim Pasha, places like Nevsehir, Gulsehir, Ozkonak, Avanos and Urgup prospered and mosques, kulliyes (a collection of buildings of an institution, usually composed of schools, a mosque, lunatic asylum, hospital, kitchen, etc.) and fountains were built. The bridge in the centre of the town of Ozkonak, which was built during Yavuz Sultan Selim’s campaign to the east (1514), is important in terms of being an early Ottoman Period building. The Christian people living in the area were treated with tolerance in the Ottoman Period as in the Seljuk Period. The 18th century church of Constantine-Helena in Sinasos-Urgup, the 19th century church built in honor of Dimitrius in Gulsehir and the Orthodox Church in Derinkuyu are some of the best examples of this tolerance.